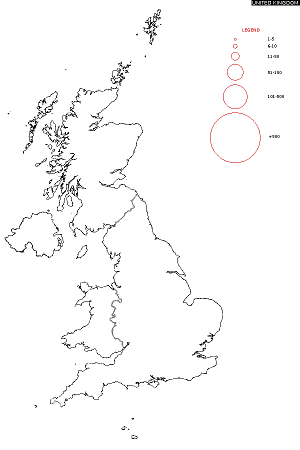 Surname Map is a project born in Italy in 2015 and pursues the following purpose: to satisfy people's curiosity about the distribution of their surname in the United Kingdom. The surname has an important historical significance and represents the belonging to a family creating a link between us and our ancestors. For this reason it becomes important to understand how much our surname is widespread, where it is more concentrated, to identify the presence of several stocks or, on the contrary, to discover its rarity. This information helps us to better understand a word that in fact is assigned to us at our birth, accompanies us throughout life and will be handed down to our children. Our maps of the surnames were obtained by processing over 22 million data, obtained with an immense and precise collection work from the old telephone directories of the beginning of the century. For this reason our maps are not updated and do not include information on users who have never owned a phone. We have specifically chosen not to use recent data to count on a larger database of users. In fact, the advent of mobile telephony in recent years has reduced the number of fixed users. Moreover, the main purpose of our project is to allow people to research the origins of their surname and for this purpose it is better to use non-recent data.